If you’re thinking of taking home a new SUV with the holidays approaching, then buy or lease a 2017 Honda CR-V! The new CR-V will be arriving on our lot later this month, and it will provide you with driving thrills, enhanced entertainment options, and advanced safety systems. 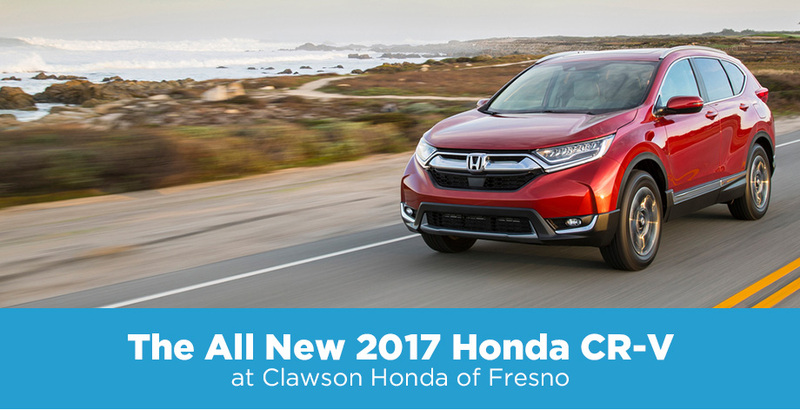 Be sure to stop by and speak with the Honda sales team at our Honda dealership in Fresno, CA, to learn more about the new CR-V and when it will be arriving on the lot! The 2017 CR-V provides you with a choice between a standard 2.4-liter or an optional 1.5-liter turbocharged engine, giving you top-notch horsepower and torque for all your journeys. Opt for all-wheel drive and you’ll enjoy added traction during your daily commutes, too. The new CR-V is as efficient as it is powerful; with up to 34 highway mpg,* the new CRV will let you cruise for miles while others will be stuck at the pump. The new CR-V allows you to ride in style with premium interior comfort options and modern entertainment technologies as well. A 7-inch Display Audio touchscreen interface provides you with an optional Honda Satellite-Linked Navigation System™, which will help guide you to all your destinations. No matter where you’re headed, you can drive with confidence, too. With optional safety technologies like a Lane Keeping Assist System and Adaptive Cruise Control with Low-Speed Follow, you’ll be well protected at every turn. 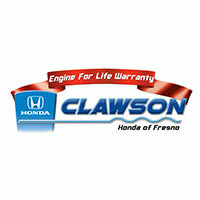 Prepare for the release of the new 2017 Honda CR-V and speak with our staff to learn more about this incredible compact SUV that will be on our lot later this month at Clawson Honda of Fresno! *Based on 2016 EPA mileage/highway estimates and driving range ratings. Use for comparison purposes only. Your MPGe/MPG and driving range will vary depending on driving conditions, how you drive and maintain your vehicle, battery age/condition, and other factors. For additional information about EPA ratings, visit http://www.fueleconomy.gov/feg/label/learn-more-PHEV-label.shtml. Please fill out this information to Pre-Order your 2017 Honda CR-V. You will be contacted shortly!